Where and when are your recitals held? Our recitals are held at BCIT Medford Campus. We hold our annual recital usually on the 3rd or 4th Saturday of June and it is a super fun event! When do the dancers start learning recital choreography? We are a technique based studio. Dancers are learning the foundation of their specific dance style throughout the year. We do not start teaching the recital choreography until mid February. We feel that when your dancer is learning the correct technique for several months, it’s easier to pick up and learn the recital choreography when that time comes. Your dancer will be prepared and confident! What are your hours of operation and is Customer Service available throughout the day? 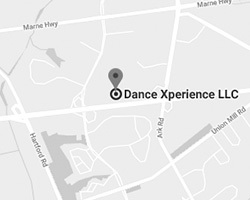 Dance Xperience is open Monday – Friday 5pm-9:30pm and Saturdays 8:30am-1:30pm. Customer Service is available via phone (856-787-1117) and email ([email protected]) 24 hours a day, 7 days a week! Are parents able to observe classes each week? We have a closed circuit TV that parents can watch their dancer take class every week. This enables the students (especially our tiniest of dancers) to focus on having a blast in class and not worrying about mom and dad watching. Besides the recital, what other opportunities can my child be a part of? We have PLENTY of really awesome opportunities for dancers of all ages! We have our Disney company, Competition dance company: DXC, Production company, Winter Showcase, Dad dance, and really fun events for little ones such as Tea Parties and Movie Nights. It’s all part of being in our dance family! How old does my child have to be to take a dance class? What does my child need to purchase for dance class? When you register for class, we will give you information on exactly what your child will need for dance class. Usually it is a leotard, tights and special shoes depending on the style of dance. We also have special discount codes for several stores online and in our area. Bonus! You can register over the phone (856-787-1117), in person or online. We offer Ballet, Pointe, Tap, Jazz, Hip Hop, Modern, Lyrical/Contemporary, Musical Theatre, Acro and special classes for ages 2-6yrs in our Twinkle Star Dance program. Do you take male dancers? Yes! We even have a Boys Only class! Great question! It depends on the age of the dancers: 2-3yrs we close at 10 dancers, 3-5yrs we close at 12 dancers, 6-9yrs we close at 13 dancers and 10yrs & up we close at 15dancers. This ensures that your dancer is receiving personalized attention in each class and is progressing wonderfully.